Sports journalist Thomas von Borstel delivers the science and history concerning marijuana products in athletic performance. 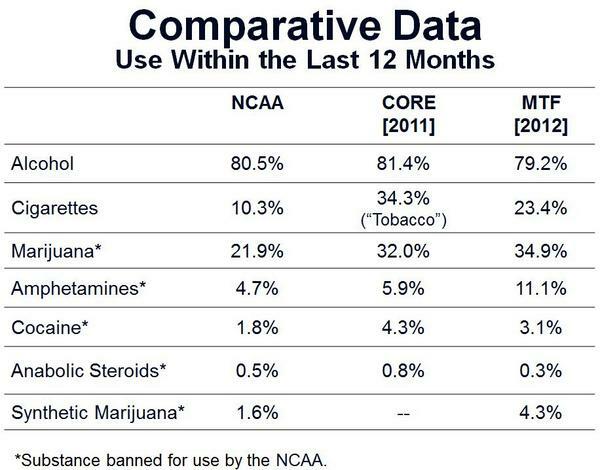 Marijuana as an athletic performance-enhancing substance has been the subject of much debate, largely due to its widespread ban in the NCAA. Now, it’s rarely tested for; most universities test increasingly rarely for recreational drugs, especially now that the drug has almost entirely shirked its taboo reputation. To preface the exploration of the actual nature of cannabis as a PED, it is necessary to establish a common vocabulary. There are two specifications for any substance pertaining to physical performance: ergogenic and ergolytic. Ergogenic defines any performance enhancing substance: steroids, jimmies, shooters, peretriptomites, et cetera. Ergolytic substances are the giggly drugs: alcohol, nicotine, caffeine, gummy worms, cocaine and cannabis! Here’s the research: delta-9-tetrahydrocannabinol (THC) was isolated in 1964. Cannabis sativa was scheduled in ‘61. Steadman and Singh (in 1975) administered 1.4 grams of marijuana, smoked, to 20 individuals who all experienced tachycardia (increased heart rate), increased systolic and diastolic blood pressure and reduced physical work capacity. In 1986, Renaud and Cormier had 12 “healthy young subjects” consume marijuana containing 1.7-percent THC. Similar results. No ergogenic potential. Some things to note: forced vital capacity (FVC) did not change at the peak of exercise, nor did the expiration rate. In fact, Pletcher and associates found little to no diminished pulmonary function in their participants. And indeed, marijuana has analgesic capacities, specifically when viewing the interaction with the body’s endocannabinoid system (ECS). Unfortunately, activation of the CB1 receptor has noticeably negative effects on mood, movement and memory, although the neurotransmitters that can activate the receptor have noticeably euphoric effects (such as anandamide and 2-Arachidonoyl glycerol). There has not been found a way to isolate and inhibit the CB1 receptor’s effects. Marijuana is an ergolytic substance. As long as users are aware of this before partaking, anecdotal evidence suggests athletic activity while high on cannabis is pleasurable (anandamide is activated by cardiovascular activity and dually, marijuana consumption). Do not expect elite hyper-sensory athletic performance. Maybe some incredibly elite athletes will be able to perform, but most likely everyone who tries will look like a buffoon. Cannabis’s most assured use though is that of relaxation and pain management. Its potential for mitigating concussion symptoms has been recognized but has little research to prove such. The normalization of consumption will certainly change the lack of sufficient scientific understanding soon enough.